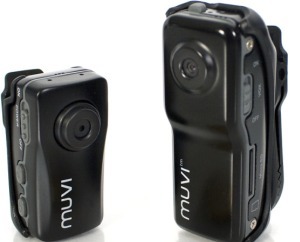 Meet Muvi, the world's smallest 1.5-inch digital camcorder. The device shoots 640×480 resolution images at 30 frames per second. Muvi comes with a 2GB microSD card. The camcorder can also accept an 8GB microSD card. It is worth mentioning that you can film in AVI format up to 1 hour on single charge. Besides you can use the device as a PC webcam. There's one interesting feature in Muvi - you can start or stop recording using voice commands. The camcorder can be charged via USB.